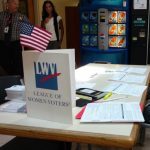 In 2016, we held Voter Registration events in the cafeteria at Lincoln Tech, Allentown, PA. Membership and dues are essential if we are to carry on the work of the League at the local, state and national leagues. We must continue to maintain and increase our membership to remain an effective lobbying force. Remember, you don’t have to be highly informed to be a member – we learn together. If you can’t attend meetings, our local, state and national Voter can keep you up to date. 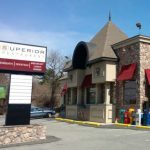 Between September and April, we hold eight Hot Topics Luncheons in the Banquet Room at the Superior Restaurant in Emmaus. They provide us with a microphone and a power point projector. 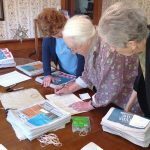 Your separate contributions to The LWV-Education Fund will offset the cost of this room as well as the printing of the Government Directory and the Voter’s Guide. We hold our Annual Meeting luncheon on a Saturday in May. We follow a formal script to vote in new board members, review the positions on local issues and attend to other administrative needs For example, Molly Faust, Chris Herbener, Mary Anne Stinner and Pat Swan were appointed to the Nominating Committee. If you did not attend the meeting on May 12, 2018, you can download the Agenda and Annual Meeting Booklet (not including financial information) and our Positions on Local Issues. New: the Website Report. Members may contact Janet Little if they would like to receive the financial information contained in the booklet. Your participation in the League will help to keep us vital and you’ll find the League is more informative when you are involved. Time commitment can be brief, moderate or lasting. Are you concerned with restoring confidence in the political process and promoting increased involvement of citizens in the civic life of their communities? If so, then now is a great time to rejoin the League.